I held a conference call, yesterday, to consider a development plan for the Muirburn Code that will include the review of the supplementary information that is attached to the Code. The aim of the call was to invite a small group to act as a sounding board to consider outline plans for the preparation of a Development Plan for the Code. Participants in the conference call were: Michael Bruce (Firebreak Services), Ronnie Kippen (SGA), Alex Stoddart (SACS) and Ian Wilson (NFUS). Tim Baynes (Moorland Groups) and Merlin Becker (GWCT) were unable to join the call. The latest version of the Muirburn Code provides the context for management of vegetation by burning and cutting, but there is now an opportunity to consider how to interpret the guidance in a way that helps practitioners to understand it. The discussion that took place, yesterday, served to highlight some key issues that need to be addressed. 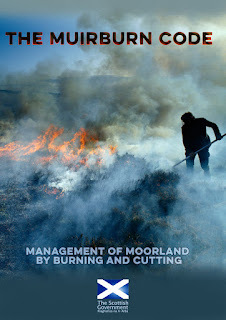 Some of the most challenging are the provisions surrounding burning on deep peat and what that means for practitioners; the Code reflects Scottish Government policy but additional guidance in the supplementary information will help to provide the connection between policy and practice. Another area to be addressed is the connection to the different circumstances that exist in parts of the country. A grouse moor with several gamekeepers available to carry out muirburn is in a very different situation to a crofter, a shepherd or deer stalker on the west coast who manages large areas and is often single-handed. What to include in the range of supplementary information is a key issue for further consideration. Those on the call were asked to consider the current list and to make suggestions for improvements to the existing supplementary information and expansion of the range of topics covered. I will welcome suggestions from anyone else. The next steps will be to produce a draft of the development plan and then circulate it to a muirburn group initially and then more widely to allow it to reflect the views of a wide range of people.